What does that mean, 'mindful practice'? Practice without being aware of what you are doing, what you need to get better results, is just practicing 'bad' habits. It does very little good to cement poor technique firmly into the memory. A friend once said that I got more weaving done on a 'bad' day than she did on a 'good' day. Part of the reason for that is the simple fact that I have spent decades - literally - mindfully practicing what I do, changing things as I realize that I could do them 'better' and taking the time on the slippery part of the learning curve to make better processes work for me. For the past few weeks I have been struggling with adverse drug effects that are sucking the energy right out of me. Getting to the studio is difficult but I force myself to do as much as I possibly can. Because I have a lot that I want to do and time marches relentlessly on. Today I did a little time study. I wove a 72" table runner (22 ppi x 72" = 1584 plus 122 picks for hems = 1706 picks) in about 55 minutes. That included stopping to wind three more bobbins. 1700 divided by 55 minutes = about 30 picks per minute. That also included stopping to change bobbins and advancing the warp. So, my weaving rhythm is actually higher than that. 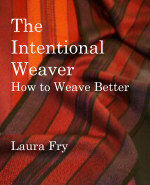 So far today I have woven 7 feet in the morning (same ppi) plus the 6 feet I just did. After laying down for half an hour, I am about to head for the loom again and see how much I can get done before it's time to make dinner. For people who say they will never be as fast I as am, I ask...why not? What I do is not a secret. Why I do it as quickly as I do is because I've practiced. So can anyone else. For those people who say they don't want to be as fast as I am, I say...there is no reason you need to. Do what makes you happy. That is all there is to it. I always say, "Go slow to go fast." Which means, as you say, being mindful, aware, thinking it through, finding the most pleasing path. In music, we call it practicing mistakes when we keep hitting that same wrong note. Slow it down, play it right, get the muscle memory, then speed up. Go slow to go fast.